Mr. PAUL. Mr. Speaker, I thank the gentleman from Texas for yielding me this time. I would like to start off by saying that I admire political courage. I have been fascinated by the Members from the other side of the aisle who have been willing, in the light of day and before the American people, to stand up and tell us that they do like it to be easy to raise taxes, and they object to making it more difficult to raise taxes. So I admire them for that. But we must ask, why are taxes high? Taxes are high because government is big. We are dealing with only one-half of the equation. As long as the American people want big government, as long as they want a welfare state, and as long as they believe we should police the world, taxes will remain high. This is a token effort to move in the right direction of eliminating taxes. Big government is financed in three different ways. First, we borrow money. Borrowing is legal under the Constitution, although that was debated at the Constitutional Convention, and the Jeffersonians lost. Someday we should deal with that. We should not be able to borrow to finance big government. Something that we do here in Washington which is also unconstitutional is to inflate the currency to pay for debt. Last year the Federal Reserve bought Treasury debt to the tune of $43 billion. This helps finance big government. This is illegal, unconstitutional, and is damaging to our economy. But we are dealing with taxes today. Taxes today are at the highest peacetime level ever, going over 21 percent of the GDP. The problem is that taxes are too high. I commend the gentleman from Texas (Mr. BARTON) for bringing this measure to the floor. I would say this is a modest approach. Today we can raise taxes with a 50 percent vote. I and others would like to make it 100 percent. It would be great if we needed 100 percent of the people to vote to raise taxes. I see this as a modest compromise and one of moderation. So I would say that I strongly endorse this move to make it more difficult in a very modest way. Mr. WATT of North Carolina. Mr. Speaker, I yield myself 1 minute just for the purpose of asking the gentleman from Texas (Mr. PAUL) a question. I take it that the gentleman believes that government is too big and that is a function of both what it takes in and what goes out, what it spends out. So would it be fair to say that the gentleman would support a constitutional amendment requiring a two-thirds vote for expenditures, too? Mr. PAUL. Mr. Speaker, if the gentleman will yield, that sounds like a pretty good idea. Mr. WATT of North Carolina. Mr. Speaker, I thought that might be the case. Mr. Speaker, I reserve the balance of my time. 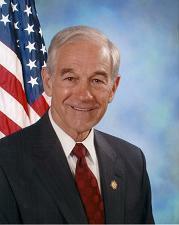 1999 Ron Paul 27:1 I thank the gentleman from Texas for yielding me this time. Here, Ron Paul thanks The Honorable Joe Barton.